There are several different ways that the newsreader can access messages in a group, depending on how it is programmed and on what the user of the software wants. This is the brute force technique: the client simply requests that the server send it all the messages in the group. This is done by issuing the ARTICLE command to select the first current message in the group, using the first article number returned by the GROUP command. This sets the server's internal pointer for the session to point to the first article, so it can be retrieved. The NEXT command is then used to advance the pointer to the next message, and the ARTICLE command to retrieve it. This continues until the entire group has been read. Figure 313 illustrates the process. There are many ways that an NNTP client can access and read Usenet messages on a server. One common method is to retrieve the entire contents of a newsgroup. 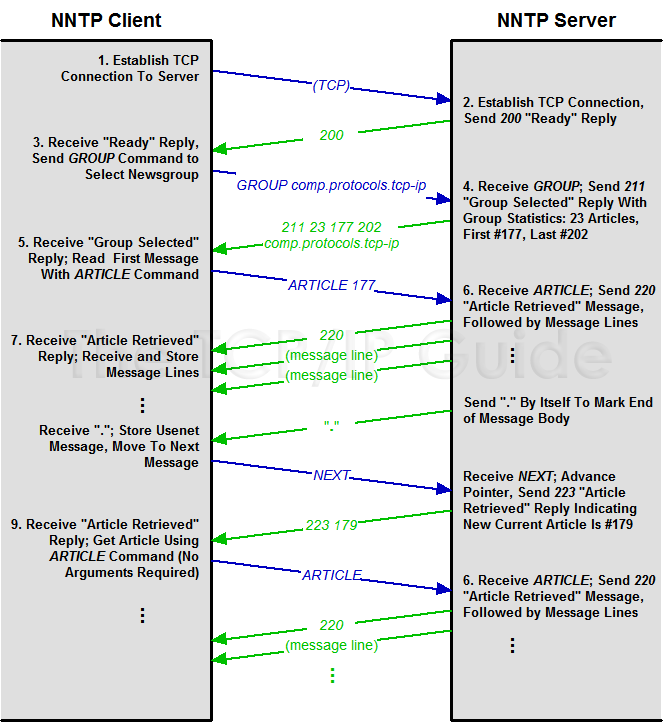 In this example, the client uses the GROUP command to select the newsgroup comp.protocols.tcp-ip for reading; the server responds with a 211 group selected reply, which includes important statistics about the group. The client uses the ARTICLE command with the number of the first article in the group, 177, to read it from the server. The server then sends the message line by line, ending it with a single period on a line. The client uses the NEXT command to tell the server to advance its internal article pointer to the next message, which often will not be the next consecutive number after the one just read; here it is 179. The client can then read that message by sending the ARTICLE command by itself; since no parameters are given the server returns the current message (#179). The retrieved messages are stored by the newsreader and available for instant access by the user. This method is most suitable for relatively small newsgroups and/or users with fast Internet connections. Since downloading an entire newsgroup is time-consuming, many newsreaders compromise by downloading the headers of all messages instead of the full message. The process is the same as for full newsgroup retrieval, but the HEAD command is used to retrieve just an article's headers instead of the ARTICLE command. This takes less time than retrieving each message in its entirety. The XHDR command extension can also be used, if the server supports it, to more efficiently retrieve only a subset of the headers for the messages, such as the subject line and author. It is also possible to retrieve a single message from a group, using the ARTICLE command and specifying the article's message identifier. Key Concept: While NNTP is best known for its role in inter-server propagation, it is also used by Usenet clients to write and read articles. A number of different commands provides flexibility in how articles can be read by a client device. A client can retrieve an entire newsgroup, only a set of newsgroup headers, or individual articles. Other commands also support various administrative functions.